New requirements for visibility drive different options, particularly for safety and security. As the need for safety and security grows across application areas such as automotive, industrial, and in the cloud, the semiconductor industry is searching for the best ways to protect these systems. The big question is whether it is better to build security and safety into hardware, into software, or both. The answer isn’t entirely clear yet, but one of the options under consideration is something of a middle ground—software that runs directly on the chip, rather than being written to application programming interfaces in an operating system. This kind of bare-metal programming includes everything from real-time operating systems and drivers to Type 1 virtual machines. It is extremely fast and reliable, because it doesn’t have to go various software abstraction layers, but it’s also difficult to develop for a modern chip. As systems became more sophisticated, software specialists began to get involved. These specialists tended to be engineers with a significant knowledge and understanding of hardware, so they were quite happy programming close to the hardware. But rising complexity has made this much more difficult. With increasingly powerful microprocessors/microcontrollers and larger memories, the need for a rational program structure drove the adoption of real-time operating systems (RTOSes) that enabled the use of a multi-tasking model. It was a natural progression for the drivers to become part of the RTOS. When developing an embedded system, an early decision to make is whether to employ an RTOS or not. Many engineers give this very little thought because they are used to coding on top of an operating system. 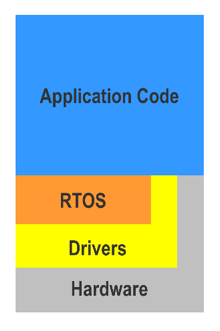 An RTOS is code written on bare metal, and it’s an important choice for design teams. The simplest structure for an embedded application is an infinite loop—do something, do something else, do something else, then repeat. Here, the most flexible and scalable program structure is a multi-tasking (multi-threading) model, where each piece of software functionality is coded as an independent program that is allocated CPU time by a scheduler (see Fig. 2). That, in turn, is part of an RTOS. Increasingly, there is interest in creating SoC monitoring systems that simply ignore things like run control, which is the classic debug of software running on a processor. Instead, they non-intrusively observe a system in real time, without affecting the behavior of the system. Working at the bare metal layer, i.e., exclusive of the operating system, can be an option. Although the largest proportion of modern embedded software designs are implemented utilizing an OS of some kind, there are a couple of circumstances when doing without—programming on bare metal—may be a reasonable decision. This could include situations where the application is extremely simple and is implemented, perhaps, on a low-end processor. It also could include situations where there is a need to extract every last cycle of CPU power for the application, and the overhead introduced by an OS is unacceptable. In both cases, thought must be given to possible future enhancements to the software. If further development is likely, starting out with a scalable program structure is a worthwhile investment, Walls said. There seems to be growing interest in this approach. While programming on bare metal is not mainstream today, a number of companies are kicking the tires for in-life analytics, said Gajinder Panesar, CTO of UltraSoC. The goal is to observe and detect anomalies while a system is running, which is essential in autonomous vehicles if the anomaly can cause a safety-related malfunction. This can be done purely in software, but it would require software running in the stack to detect this. The big concern there is latency and the time it takes to detect an anomaly, and software closer to the metal reacts more quickly than software way up in the stack. In the automotive world, standards such as ISO 26262 are the gatekeepers. If you don’t follow those standards, you can’t sell your chip into a specific system. Many engineering teams look at the safety-related aspects at the chip level where they examine whether the system will still behave safely if this bit is stuck at a certain level. And while this needs to be accounted for at the architectural level or very early in the design process, there are also some of the mechanisms to allow the system to falls back into a safe state. Those are implemented a bit lower down. While the benefits to visibility at the bare metal level is clear, there are valid concerns about providing different levels of access to a chip. Some industry experts wonder if vulnerabilities may be introduced along the way. This is one area where formal verification can play a vital role, because it can identify potential problems across a complex system that may not be obvious. Clearly, there is work yet to be done, and solutions are still evolving—especially in security. Bare metal programming may be the ultimate compromise between hardware and software, but it requires a deep understanding of both at the very outset of the design process. So while there are clear benefits, this stuff isn’t easy.